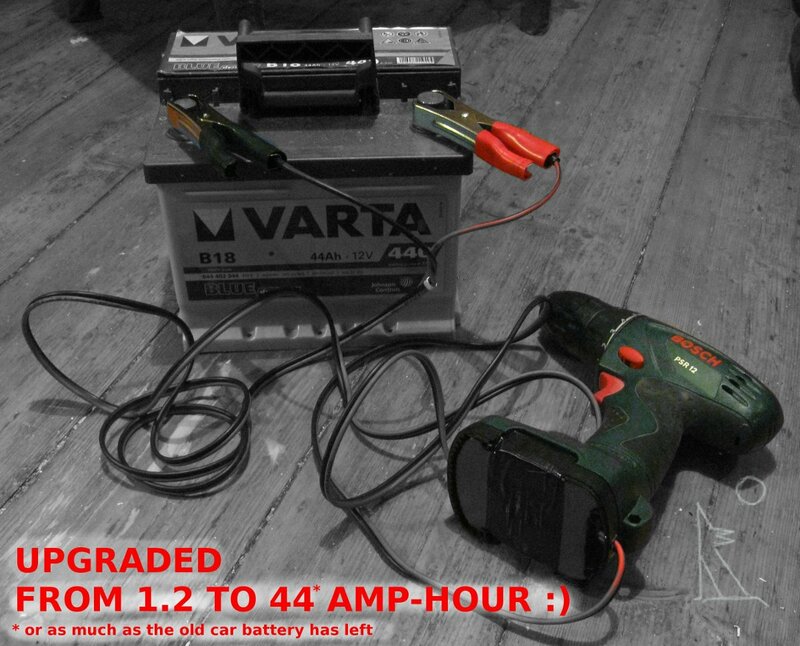 Battery drill revival as "semi-corded"
The picture tells it all. It's luckily a 12V drill. And I got that battery someone abandoned because it was too weak for a car (I live in very northern climate, people often have trouble with batteries around here.) And I own a car battery charger to keep that big thing running. But it should not require charging very often, so you could manage with borrowing charger from a friend from time to time. If you are contemplating some sort of plug to wall hack for your sad formerly-battery-drill, then be informed that it's a tough topic. Many people contemplate it, few actually make a solution and even these seem very much like fire hazard. In case you are interested in more scientific data, here's a video that shows how much current my drill needed. In short, while working on constant speed the current consumption is about 3A. But at the moment of starting up or accelerating fast, the current consumption jumps to the end of 10A scale. Might be 15A ... I did not test heavy load (I just tested drilling wood and moving freely). The current consumption of a motor is biggest while the load is so heavy as to stall the motor. And finally here's what I did with the suitcase that became obsolete without the original batteries.